Almost any programming tools can be used to implement the ETL, such as SSIS, C#. No matter which way you go, you use bulkcopy to insert the converted trace data to your trace table. The first solution will be, the trace data is loaded to a DataTable (in .Net or DataSet in SSIS), you loop all record over the table, collapse customized event entries and RPC Complete entry, output the result to another DataTable, then send the DataTable to SqlBulkCopy component. (Assuming you already have the code to deal with the scenario where the customzed event for a session is in previously read DataTable and the RPC entry is in the second read DataTable—very daunting logic.). This will work. But it will be memory consuming and less efficient. After checking with MSDN, I found you can pass a IDataReader to SqlBulkCopy component. Why not write a class which implements IDataReader interface to process the trace data in the stream and then pass the IDataReader to SqlBulkCopy. The first, I use SqlDataReader to read the trace file, then pass the reader to the class which implements IDataReader, finally send the instance of the class to SqlBulkCopy. 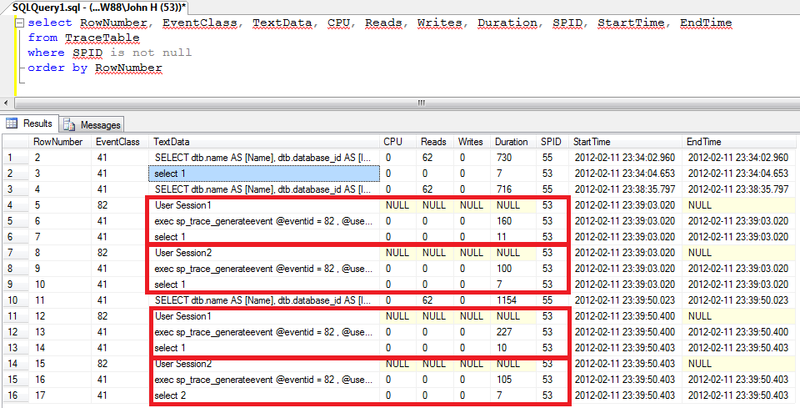 SqlBulkCopy will call Read() method from IDataReader interface in the class, the class will call Read() method of SqlDataReader. Within the class, when an record read from SqlDataReader is an Customized Event entry, then save this entry to an IDictionary object using SPID as the Key. When a record read from SqlDataReader is not a customized event, then the class lookup the IDictionary object with SPID to get the user information then output the user information with the RPC Complete entry. Dictionary<int, string> userInfo = new Dictionary<int, string>(); //save session and userinfos. //since we have SqlDataReader passed in, things become simple. //set of records will NOT be executed. //we don't need to do anything here since the implementation of IDataRecord interface has handled this. // but here I give you the example code, although this will not be called. Now let’s have some fake trace data for testing. In this way, you can process trace record in a stream. It requires minimum memory usage in which you can put it in a CLR procedure. For production deployment, you will have to add some code to make it more robust. For instance, you may want to save the Dictionary to a the table when application exit and when application is launched again, previously saved dictionary can be loaded.